There is always an element of surprise inside the temporary, deluxe showroom at Frieze Masters in Regents Park. Designed by New York-based architect Annabelle Selldorf http://www.selldorf.com, it’s an elegant structure, where classical art and old masters change owners. Only a small part of visitors could ever buy anything, but what a great opportunity for seeing rare artworks available on the market. This year it wasn’t an individual work, but the stand of Helly Nahmad Gallery http://www.hellynahmad.com, a new exhibitor at Frieze, that became the talk of the fair. Key 20th century master works, including Lucio Fontana, Pablo Picasso and Morandi were staged within a film-set-like installation; and no one passed by without stopping – at least to see why so many people were congregating there. The presentation was the total opposite of the clinical, neutral gallery cube designed for close inspection of art works – a breath of fresh air for that reason. Conceived by set designer Robin Brown, the stand conveyed an essence of bohemian 1960s Paris, with an imaginary home complete with an inspiringly chaotic study, set against a Fontana and a Dubuffet amongst an accumulation of stuff, evoking a state of creative obsession. Morandis, Miros and Picassos were scattered amid personal notes and photographs into a sprawling composition. The whole presentation had a strange sense of humanism, quite the opposite to the darker narratives seen in many contemporary installations. The setting provided an opportunity to relate with an eccentric, imaginary collector, and also to realise the transient nature of our data-driven existence. The accumulation of personal belongings, photographs and stacked magazines – in today’s world stored on iCloud and hard drives – is a link to a historical context, a previous existence before the digital age. There was a sense of nostalgia for the high modernist ideals of the 1960s, before the onset of other types of radical post-modern ideas of the following decades. The space was messy, but also strangely positive and exhilarating. Brown’s presentation provided many interesting contextual ideas around the paintings and the period when they circulated on the market as avant-garde novelties. Now these works belong to museums, or the homes of the very rich, the ‘art world’ elite, which has become a philosophical subject elsewhere. “It will be a one-off” Brown said, clearly happy with all the attention that the installation has attracted. 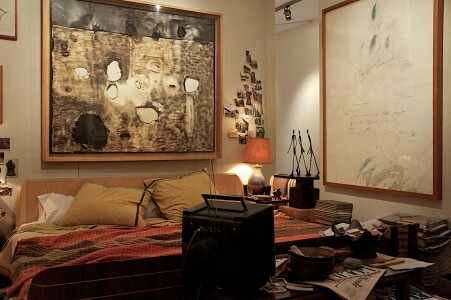 The king size bed below the Burri and Twombly paintings, next to Giacometti’s sculptures, with Godard films on the boxy TV, was a nostalgic reminder of French cultural values in dialogue with contemporary installations like Emin’s famous bed.